Published by Lewis Masonic, 2007. 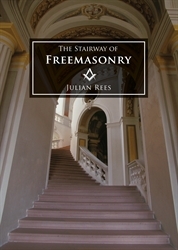 Julian Rees was initiated into Freemasonry in the Kirby Lodge, No. 2818, in London in 1968 at the age of 32, becoming Master in 1976. In 1977 he became Master of the Pilgrim Lodge, No. 238, the only lodge in England working in the German language. He is a member of the Emulation Lodge of Improvement, and has served on their Precepting Committee. He is a founder member of The Cornerstone Society of which he was Secretary. He is Deputy Editor of the international English-language quarterly magazine Freemasonry Today, and has been decorated by the Institut Maçonnique de France with the masonic Ordre de Lafayette. For any enquiring mind, whether Freemason or not, this little book sets out to help answer questions - not so much: 'What does it mean?' but rather: 'What can it mean? ', since the journey is concerned not with learning other people's answers, but in working out answers for yourself. -Why can I not become a Freemason by reading about it in a book? -What would initiation do for me? -What is the point of secrets in Freemasonry? -Why are the square and compasses in Freemasonry such a universal symbol? -What are Masonic symbols for? Do they mean anything? -Can Freemasonry be as meaningful for me as my religion? -By being a Freemason, can I be closer to God? -Why are we called Free Masons? -If secrets in Freemasonry are not to hide something, what are they for? -What does the ritual mean when it talks of avoiding fear and rashness? -How can symbols best be used? -Can working tools really be used to make me a better person? If so, how? -Why is it said that lodges stand on holy ground? -How am I to understand light in a symbolic sense? The list is almost endless! And the great thing is that you can devise your own questions, and then, by contemplation, provide the answers to them, or work out the answers in a group. But don't expect all members of the group to agree. We all have our own interpretation of Masonic symbols and practices, and there is no dogma, no 'right' answer. This book has been conceived as a companion volume to its earlier partner Making Light. Unlike that book, however, these essays can be read aloud in open lodge as well as being studied on your own at home. Some of the essays overlap each other, underlining the importance of central themes in different parts of the ritual. They are designed so that they can be used as oral instruction for an aspirant or more widely in the lodge. Incorporated in each of them are some thoughts or propositions - responding to these gives an opportunity for your own input. Writing about a half-page is suggested. You need not limit yourself to a half-page. You need not write as much as a half-page. You need not write anything at all. Your progress is entirely up to you: how much, how little, and at what speed. Above all, enjoy the journey proposed in this educational book.